During PhD studies, quite many of us spend time figuring, what will the working life be after graduation. What can you do to improve your chances outside the academia? Krista has worked closely with the industry in TOHTOS project, which aimed to develop the working life relevance of doctoral training. After getting her own PhD, she went to project management and development work in university administration. She interviewed doctor alumni and several organizations that hire doctors to find out, how can you find a job outside academia. What did the companies say, what are the most important skills for PhDs looking for a job outside academia? 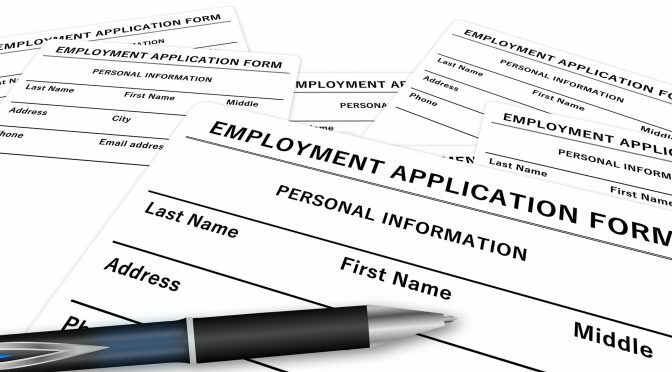 Is there something you can do during your PhD studies to increase your employability? Do not be too narrowly focused with your interests. Try something new and experience! Go abroad, if you have a chance. Take another minor to learn new. It does not have to be connected to your main research interests. Network! The more people you know, the easier it is for you to find a job. You will get to know different jobs and be aware, if there are new openings coming to the organizations of your interest. How did Krista find her way to administration? I always liked to organize and coordinate things. Besides research, I found passion for digital communication and started learning that by doing. I joined a professional organization and worked as a board member, treasurer and secretary. I did a whole lot of career planning. After graduation, I got an opportunity to start developing doctoral education. Started it, loved it, and here I am. I had to learn a lot of new tools, to create several new courses to teach, and I got a possibility to work in a large project. Once the project was over, I was offered a new, interesting position, and I happily accepted it. Is a PhD degree relevant to this type of work? My everyday work is not at all connected to those areas, I was studying as a PhD student (ecotoxicology/biology). I am now focusing on international academic affairs and participating in several projects/processes to improve the international studies in our university. 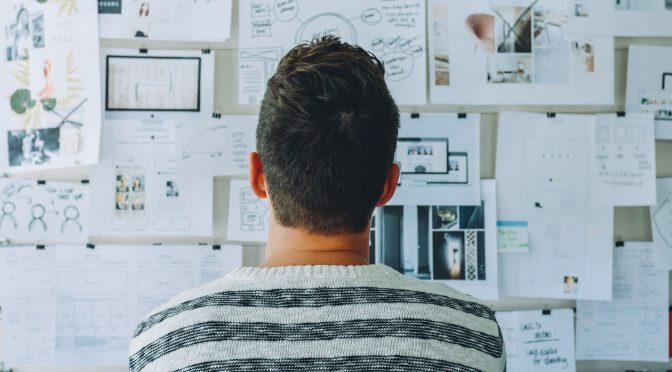 But I use quite a lot of my researcher’s skills in the job: I gather vast piles of information and compose understandable, clear and short reports out of them to support the decision-making. I use modeling software to test, what are the real-life consequences of different decisions. I present my work to different types of audiences, network a lot and learn new every day. I need to adapt fast, be fluent in English and understand different cultures. It also helps to understand digital communication and IT systems in my job. I am not doing research, but I am learning something new every day! Learn more. You can learn new research methods, use new instruments and find a whole new way of doing research. Boost your career. International research period will look good on your CV. At least in Finland, your research career path will be a bumpy one, id you do not have enough international experience. Get money for your research. Since it is not so easy to go abroad, there are fewer people after the money. Your chances of getting money are better! Networks, networks! You have a great opportunity to meet other researchers. It could lead to new, co-organized projects in the future. Superb transferable skills. What an opportunity to improve social skills, adaptivity, coordination skills, and so on. Language skills. If you are going to a country, where your native language is not widely spoken, you have a wonderful chance to improve your language skills. For us Finns, this part is easy, since there are no other countries where our language is spoken. This topic was inspired by the current status of our research group. 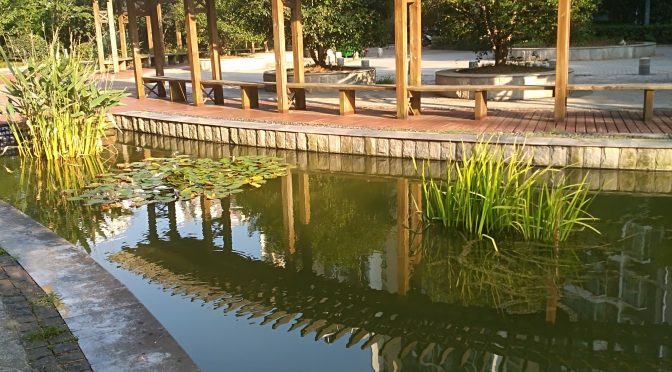 Our post doc researcher Krista just started her 6-month research period in Nanjing University, China. Her work will include environmental chemistry research in one of the top universities in China. 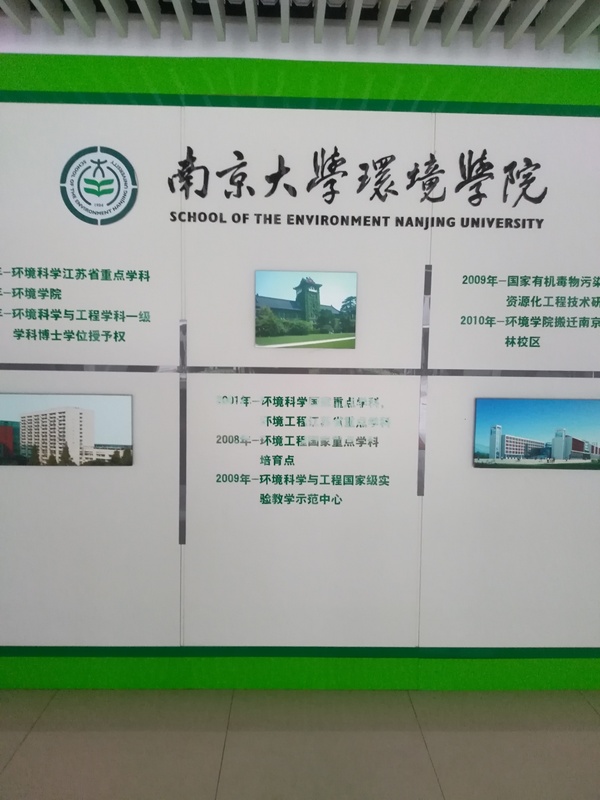 The project is funded by Outi Savonlahti fund, International Institute for Environmental Studies, and Nanjing University. How to improve PhD supervision? Are you a great supervisor? Or are you a PhD student, who is excellent in getting all the supervision he/she needs? If not, read our tips for improving yourself! Get to know the problem to get it solved. The problem might be something else than it seems at the first glance. Let your student know that you are willing to help, have common rules for communication. Have informal discussions (coffee breaks, Happy Fridays). Make sure that you are aiming at the same goals. Establish a culture. Stimulate student’s thinking by feedback. Let the student process and understand. Tell your goals, working style and communication style to your supervisor. Have goals and structure for all your meetings with your supervisor. Send information beforehand and make memos. Find your networks and meet your colleagues in informal settings. Balance your working life and free time. Wish to read more tips and some research background on the subject? How to find a work after PhD? You got your PhD diploma in your hand, but not a job. What then? As promised in our previous blog post, we’ll talk about how to find a job after getting your PhD. Write a research plan and apply funding for your own postdoc project. There are several foundations and organizations giving out money for post docs. If you include an international research period to your application, your chances of getting the grant are better. Check the application deadlines! Apply for open postdoc positions (in Finland and abroad). Check www.mol.fi, open positions in LinkedIn and Twitter, plus open positions in the universities’ web sites. Contact your networks to ask, if they have anything available: Ask your supervisors and cooperation partners, let the people in social media know that you are looking for a job. Are there any openings (or possibilities for open applications) in research organizations outside universities? 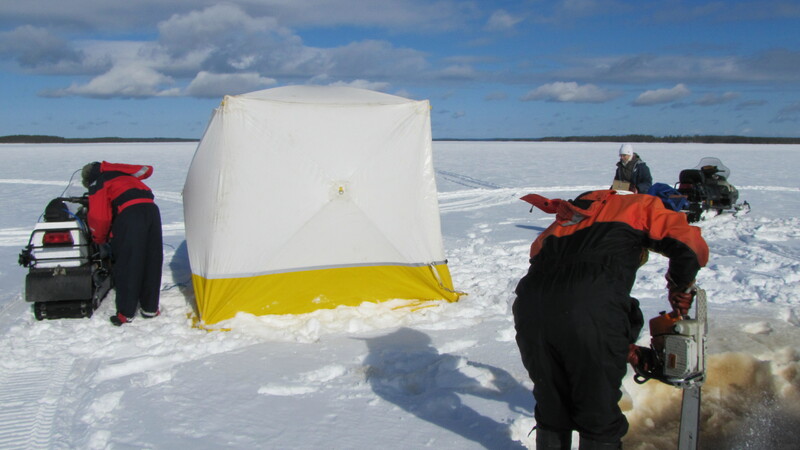 In Finland, these could include Geological Survey of Finland, Finnish Environment Institute, National Institute for Health and Welfare, Technical Research Centre of Finland. Network! If none of the previous options worked for you, widen your horizon. Go to courses, conferences and seminars. Do voluntary work in your field-related organizations. Join a mentoring program. Learn new and get to know new people. Don’t be shy, go and talk to people. Tell them who you are and that you are looking for a place to do your postdoc. 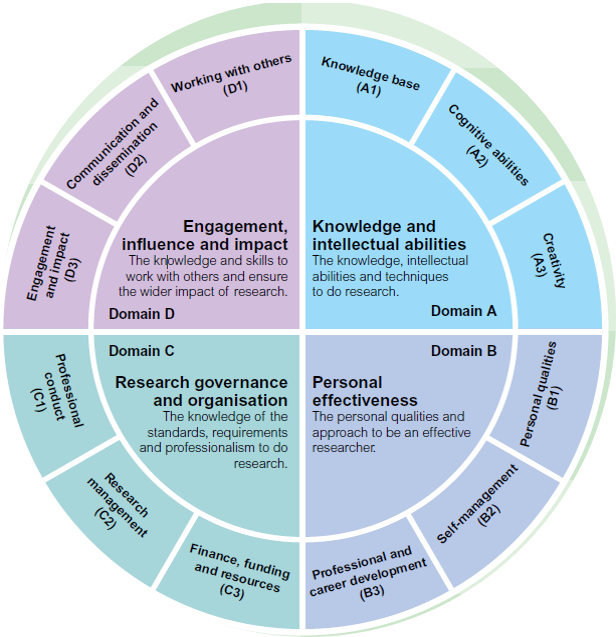 Make sure that your skills are up-to-date, for example by using the following Research Development Framework. Apply for open positions and send open applications to local government, central government and third sector. Look for the possibilities in the private sector. What kind of companies hire doctors from your field? Sell your expertise! Are there suitable vacancies abroad? Participate all kinds of job-seeking events and “improve your CV/job interview skills” – clinics. Join a mentoring program. Learn, how to sell your expertise to a company. They are not interested on your publication list or diploma – they are interested in what you have learned during your PhD studies and how can you apply the knowledge to practice. What happened to me once I got my diploma? I have always wanted to be somewhere in the middle – between the research, administration and private sector. Few months before I got my PhD diploma, I started job-hunting. I polished my CV and elevator pitch with my mentor, participated in an international job-hunting event (thanks SETAC Europe), sent five applications to government jobs, applied for one postdoc position and for two administration jobs in university, wrote a research plan (with international mobility) and applied money from five foundations. What was the result? Two job interviews, one job and one 6-month research grant. From MSc to PhD – how the process goes at UEF! Part 2. Public examination, or defense, starts always precisely at noon. Rather strict dress code is taken into consideration. Audience enters to the auditorium at 12, and fifteen minutes later, the PhD candidate walks in, together with the custos and the opponent. The examination begins with lectio praecursia, a short introductory lecture about the topic of the dissertation. After that, the opponent gives a short introduction into the topic. Custos, sitting between the candidate and the opponent, has an important role in the defense: he opens the public examination and is responsible that everything goes by the protocol. Also, he has to make sure that the opponent and candidate do not end up in a fight. During the examination, the opponent makes questions to the candidate – sometimes very easy ones, sometimes rather difficult. The candidate’s task is to answer to the questions as well as he/she can, and to have interactive conversation upon the topic with the opponent. Some tough questions in Krista’s public examination. Finally, after opponent’s final statement, the custos closes the examination. But before that, the doctoral candidate must turn to the audience to ask, if someone has something to say against the thesis. Usually no one raises the hand. In case someone does, the PhD candidate should politely invite him/her to the karonkka party later in the evening (and the person making the question should politely reject the invitation). Duration of the public examination is normally 2-3 hours, but in the official rules, the opponent can spend up to 5 hours for examining the thesis. 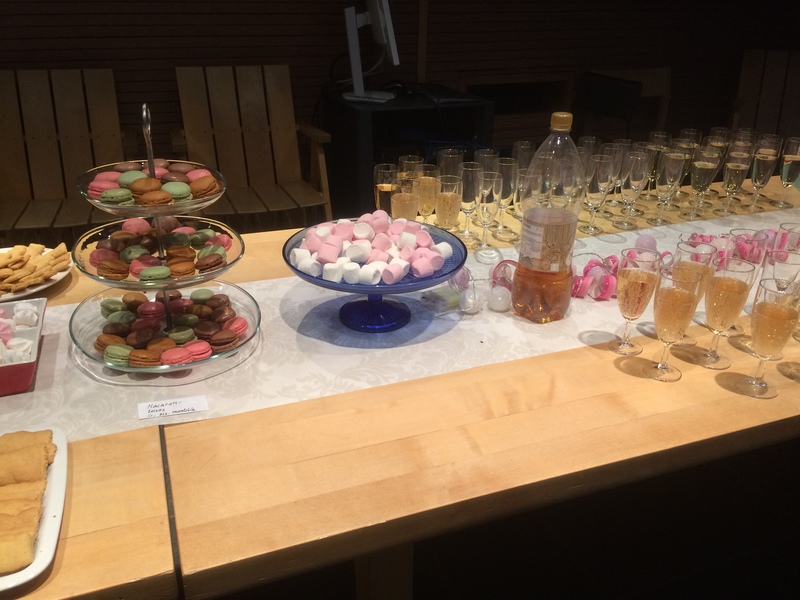 After examination, the audience is invited for coffee and cake, or sparkling wine and snacks. This is normally the moment, when the PhD candidate can breath freely for the first time!! It is time for some snacs after the public defence. Karonkka is a well-prepared dinner party in the honor of the opponent, usually held in a restaurant or ball room with a fancy dinner and appropriate drinks. The evening begins with a toast proposed by the PhD candidate, followed by a dinner. Later on, it is time for the speeches. The PhD candidate is the first one to give a speech and thank everyone who have had a role in the process of thesis making, such as the opponent, custos, supervisors, colleagues, co-authors, friends and family. In this order. There is also an unwritten rule saying that everyone whose name has been mentioned in the speech, must give a speech too. Family members may, however, skip giving the speeches, if they wish. Toasts are proposed between every speech, and the PhD candidate must make sure that the opponent’s glass is never empty. At the same time it is good to take care that your opponent does not drink too much! (Yes, we have also experienced this). Take enough time for your Karonkka preparations! Krista is preparing her decorations. Finally, after the public examination and karonkka are over, the opponent has two weeks to give his or her statement on the thesis and defense. The faculty board must accept the defense and decide on a note: accepted or accepted with honor, which approximately 5% of of the doctoral theses are awarded with. Only after this the candidate can apply for a degree certificate and call him/herself a doctor. Universities arrange conferment ceremonies every now and then, approximately once every 5 years. The next ceremony at UEF in Joensuu will take place in 2019. These are 3-day-long celebrations of appreciation for persons who have completed their doctoral degree. Participation is not compulsory, but at least in the past a doctor received a permission to use the doctoral hat (or sword in some faculties) only after being ”promoted” in a doctoral conferment ceremony. 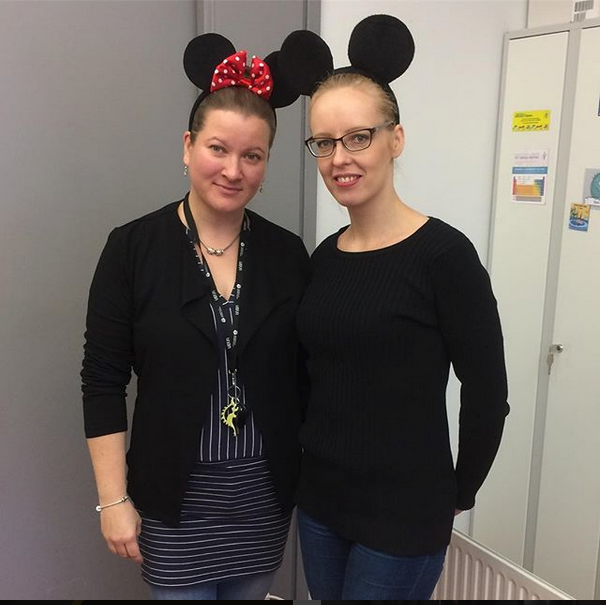 Let us introduce our two newest doctors: Kaisa and Kristiina! (they do not yet have the fancy, doctoral hats) Congratulations!! Who shall be the next? Kaisa and Krista got their doctorates! 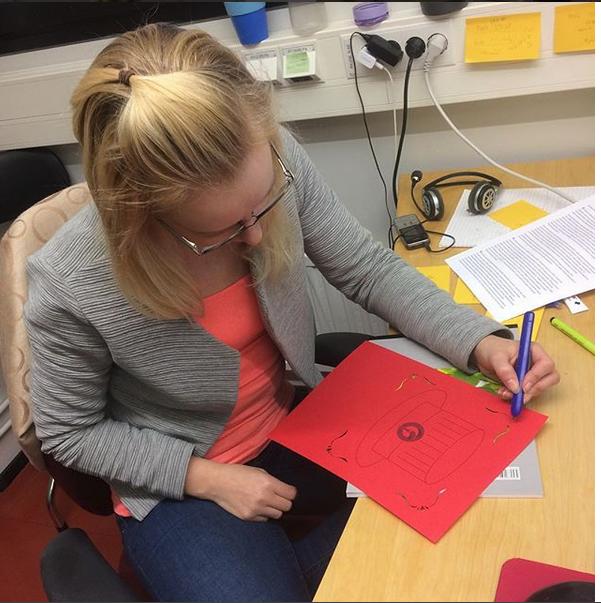 From MSc to PhD – how the process goes at UEF! Part 1. Every university and institution has its own requirements and procedures for the PhD thesis, defense and everything related to it, beginning from the process of applying for a PhD student position. From time to time we hear experiences from our neighboring countries through colleagues and co-workers. There are many differences between the processes, but also, many similarities. One thing in common is the thesis. Every PhD student must write a thesis, and have a public examination upon the thesis. We have already written many posts about the daily life of a PhD student, so we will not go into details in this post. You can read more for example here, here and here. From now on we will concentrate on what happens, once the thesis is about to be ready. Checking the layout practices from the previously printed PhD theses. 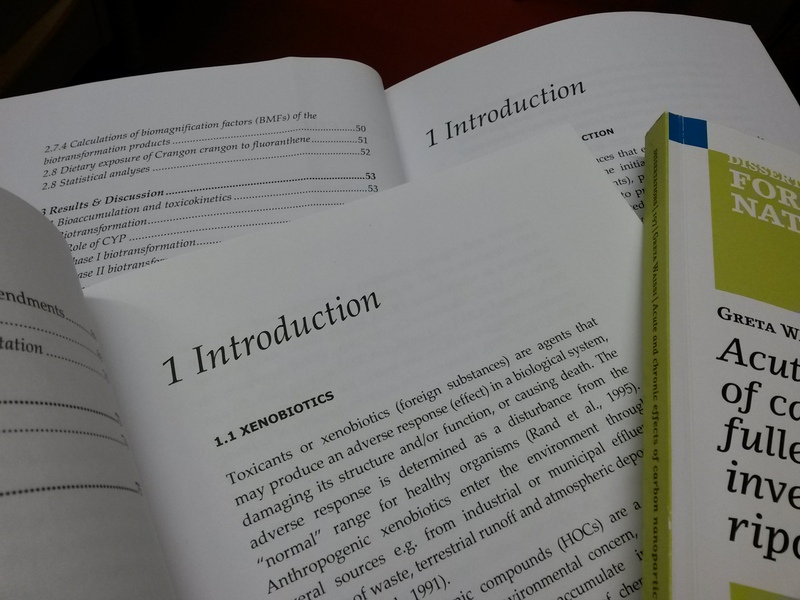 In natural sciences at UEF, a PhD thesis consists of 3-5 scientific articles, of which at least two must have been peer-reviewed and published (or at least accepted for publication) before public examination. The PhD thesis includes a thorough summary, where the most important findings of the articles have been summed up, to make a readable context that makes sense. At UEF, all PhD students are in a Doctoral School, consisting of 15 different doctoral programmes. 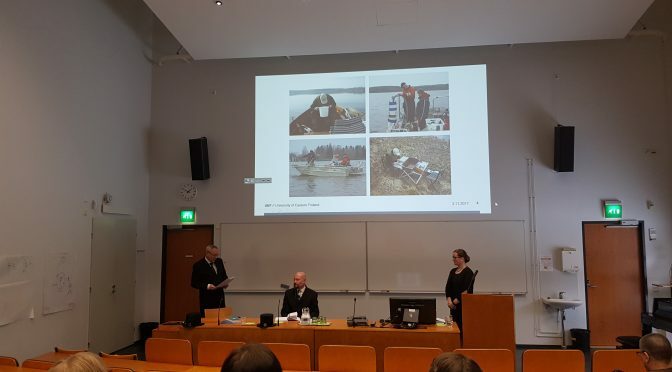 Most of the biology students, Kaisa and Kristiina included, have made their thesis and studies at the doctoral programme of environmental physics, health and biology. The doctoral school and programmes offer courses, and in some cases also grants for PhD students. It is hard work to get data for you PhD thesis! 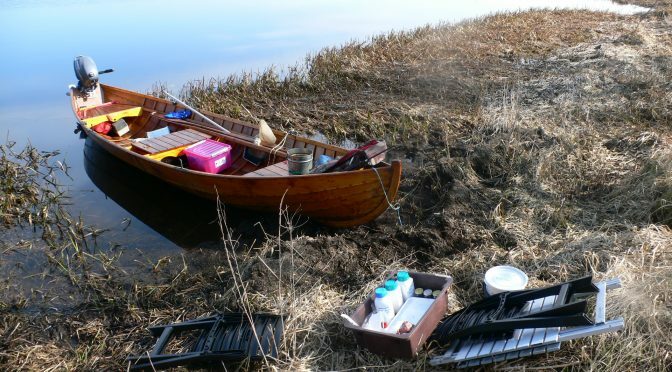 Sampling campaign in Lake Junttiselkä. When the thesis is ready, the main supervisor (in co-operation with the faculty officers) proposes two pre-examiners for the thesis manuscript. Not just anyone can act as a pre-examiner, because there are many requirements for one: Must be an experienced scientist, preferably a professor or at least an adjunct professor (we call it ”dosentti” here in Finland). Also, the pre-examiner is not supposed to have any co-operation with the PhD candidate, not reside at the same department or even the same university. Preferably, at least one of the pre-examiners should from a foreign country. The pre-examiners are given two months for examining the thesis before they need to give a statement for accepting it or not. In some cases, the pre-examiners provide useful tips for improving the quality of thesis, which should be taken into consideration before sending the thesis to press. Since at least two of the articles of the PhD thesis have already been peer-reviewed and accepted, and also the supervisors have proofread and accepted the thesis for pre-examination, the statement is positive in most of the cases. But the process in still important for maintaining the quality of the theses. 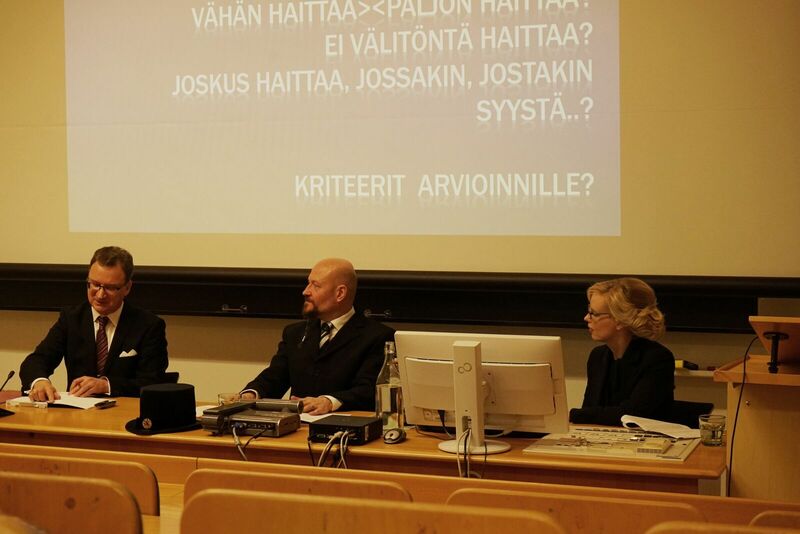 The dean gives a permission for defense (väitöslupa) only after two positive statements from the pre-examiners. Then, the thesis goes to language revision and finally to press (Grano at UEF). This process might take up to two weeks, or even longer, if the first draft does not come out in a perfect shape. The printed books get delivered to the candidate before defense, and one copy must be delivered to the library at least 10 days before the defense. Also, a publishing agreement must be written with the UEF library. The library officers offer the key words and classification number for the thesis. This must all be done before sending the thesis to press. A press release must be prepared too, following the instructions of the communications and media relations department. Also, a proposal for opponent and custos must be made in advance for the faculty. However, this cannot be done before the permission of defense has been obtained. Do not forget to send invitations! Official photo must be taken at a local photographer in advance! Agreement on the dresscode together with custos and opponent. Check the availability and reserve the auditorium in advance, otherwise you will not have options! What to expect for your defence day? Stay tuned for part 2! Good coffee makes a day! Which brands are our favourite? In our laboratory and office we do high-quality environmental research, but nothing gets us awake to a new working day better than a good coffee! Fresh made coffee has become an important part of our daily routine and little by little we have created a semi-scientific approach to coffee brewing and tasting. We brew our coffee two to three times a day using a basic French press coffee maker and an electric water boiler and normal tap water, which originates from ground water in the Joensuu region, known for its good qualities and excellent purity. In our opinion, coffee has its optimal taste when enjoyed on a ceramic or clear glass coffee mug. Our favourite type of coffee is dark or medium dark roast, and we appreciate organic coffee and ecological and fair trade values, independent on the origin country. We also enjoy tasting new coffees and never stick to one particular brand or type for more than one package at a time. Together with the coffee we always use milk, preferably Arla´s Café-maito or any other whole milk available. Skimmed or semi-skimmed milk is a no-no with coffee. Our department has a shared coffee room where coffee is brewed constantly throughout the day, but we have decided to stick to our own routine and preferences when it comes to coffee and its additives. This has led to several curious co-workers passing by our office after having smelled a delicious scent of good coffee in the corridor outside of our office. A couple of months ago we came up with an idea to taste new coffees that we had never tasted before. We sent email to some coffee roasters in Finland and asked them for advice for coffee selection. Two of them kindly offered us some of their coffees for tasting, and so we put up an official female scientist’s coffee tasting club at the office number 368. 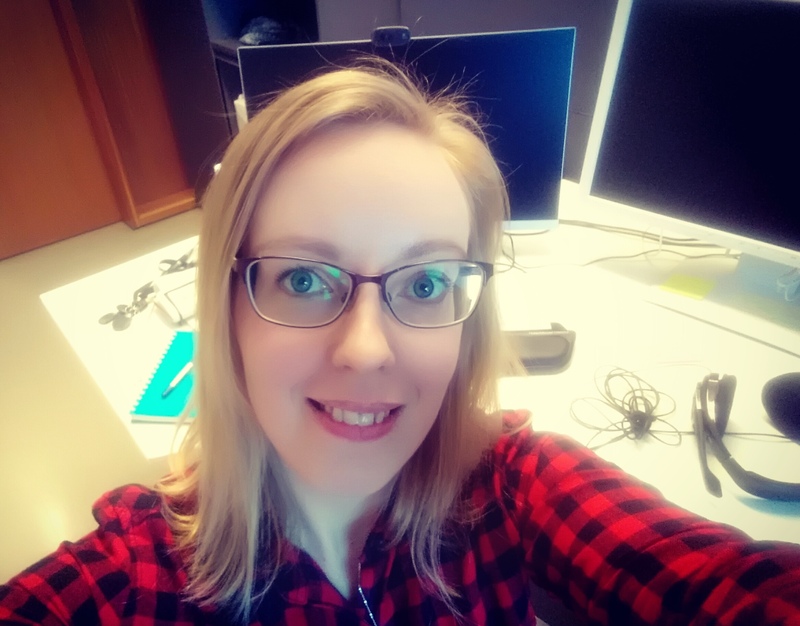 Our high-qualified test group will be introduced here: Krista Väänänen has always been a tea drinker, but after moving to our office and getting under the influence of other coffee drinkers, she has also started to appreciate good morning and after lunch coffee. 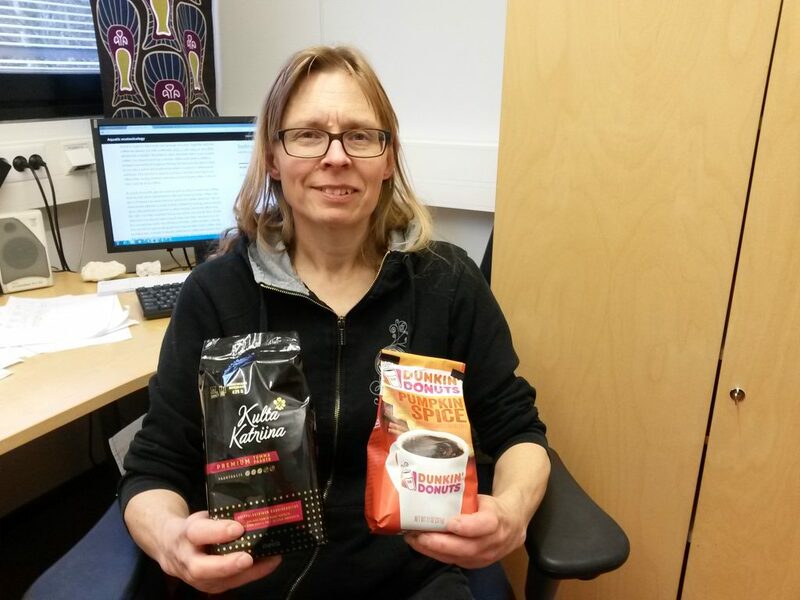 Kukka Pakarinen, instead, is heavily addicted to coffee and cannot start her mornings without a strong coffee shot, otherwise she would get doctoral withdrawal symptoms. Kaisa Figueiredo, the 3rd member of our tasting team, has been married to a Brazilian for almost 10 years, and therefore good coffee comes for granted in her family. The free samples that were kindly sent to our coffee tasting. 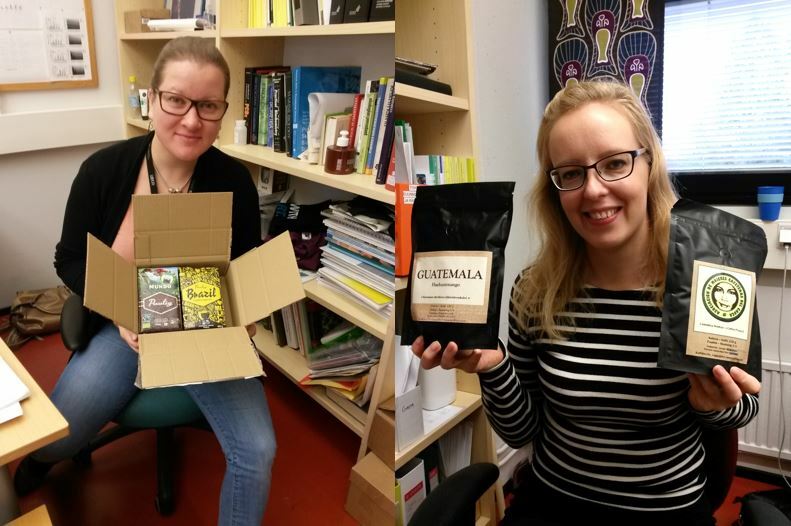 Left: Kaisa with package from Paulig. Right: Kristiina with Kaffiino coffees. Oy Gustav Paulig Ab kindly sent us two packages of their UTZ-certified coffees: Mundo (roasting level 3, on a scale 1 to 5) and Brazil dark roast (level 3½). Kaffiino roastery offered to us two different coffees from their quality selection: Guatemala Huehuetenango and Colombia Woman´s Coffee Project, both with roasting level 3. Additionally, we bought one package of Arvid Nordquist REKO, Meira’s Kulta Katriina dark roast premium, and Paulig´s new city coffees café New York and café Havana to complete our test procedure. As an extra bonus sample, we had Dunkin Donuts Pumpkin Spice flavored coffee brought directly from the United States of America, where one of our group members went on a conference trip in November. All of these sampled coffees were ground to suit a French press coffee maker and therefore fitted well for our needs. What can we say about the coffees then? It was difficult to define if one coffee was better than another. Paulig’s Brazil dark roast is a very good coffee for basic everyday use, and we preferred that over Paulig’s Mundo. Although Mundo is organic and UTZ-certified, its flavour did not reach the qualities of the others. However, the city coffees New York and Havana were proven excellent coffees as well. The medium roasted New York has a well-balanced taste and it will be our future favourite to serve in parties and gatherings. Dunkin donuts gave a good boost for upcoming Christmas time, but after all was our least favourite of the selected coffees. Instead of filling the coffee maker with Pumpkin Spice flavoured coffee, we mixed one coffee scoop of that and five scoops of Kulta Katriina’s dark roasted coffee, and still felt the flavour very strongly in our coffee. The taste was rather sweet and artificial, and the coffee itself was a bit too light to our taste. Kukka with Kulta Katriina Premium dark and Dunkin Donuts Pumpkin spice coffee. Kaffiino offered us two special coffees, which we immediately felt that were “luxury” for us. Beautiful well-designed packages, delicious scent and a perfect grind for French coffee makers. Both coffees that we received from Kaffiino were very good, but of some reason did not convince us at a first taste. However, from the second taste onwards they tasted excellent, and the only bad thing about the coffees were that they did not last for the whole week. Going back to market selection after drinking these great coffees was a bit disappointing. By the way, did you know that in Kaffiino’s web shop you can buy a large selection of coffees from different origins, and even design your own label for the coffee package? What would be a better Christmas present than a good coffee with your personalized label? Finns are the people with the highest consumption of coffee in the world, at 12 kilos per person per year and coffee in Finland has traditionally been roasted lightly, brewed with a filter coffee maker and enjoyed pure, or with sugar/milk. After all, when it comes to coffee preferences, it is always a matter of taste – some like it espresso-like dark and strong, while the others have it filtered and light, or anything in between. Others buy the cheapest supermarket coffees, while others pay attention on the roast, origin and ecological aspects. We have made our choice and we thank our sponsors Paulig and Kaffiino for offering us a tasting menu from their selections. The winner of the competition is Kaffiino’s gourmet coffee Guatemala Huehuetenango, which definitely was creamy and full-bodied as stated in its description. How to make a (better) poster? We have all been there. You have done your research for a while, got your first results and want to go to a conference to present your work. What then? At least I and my colleagues wanted to start with having a poster presentation. I did not have enough data (or confidence) for an oral presentation, so poster it is! These are my opinions and experiences about making a poster, feel free to disagree :). For larger conferences, you need to send your abstract months beforehand. It is really difficult to prepare it so early, since you may not even have all the data by that time. With an abstract, you need to come up with at title. I would advise to use a lot of effort in planning your title. It is the first step where audience decides, if they want to see your poster or not. Use keywords in your title and be precise enough. Think in advance, what kind of audience you would like to attract. Conferences usually have guidelines for posters – check them! In Europe, posters are usually smaller than in North America, most often size A0. Also, European posters are typically as portrait, compared to American counterparts in landscape. It is really disappointing to prepare a poster just to find out that it doesn’t fit in the poster stand at all. Typical poster types in Europe and North America. What would you like to tell in your poster? As a young scientist, it is tempting to present everything you have done. For my first poster, I was feeling a bit insecure and embarrassed to be such a newbie, so I wanted to show all my work in order to appear more professional. Stop right there, it’s the worst plan ever! Think about your most important/interesting result and focus on that. It is better to highlight an exciting point than tell a little bit of everything. This leads to the next step – compress, compress and compress. A text overload is a common mistake and it makes the poster look dull and scare the audience away. Leave only the most important content to your poster. 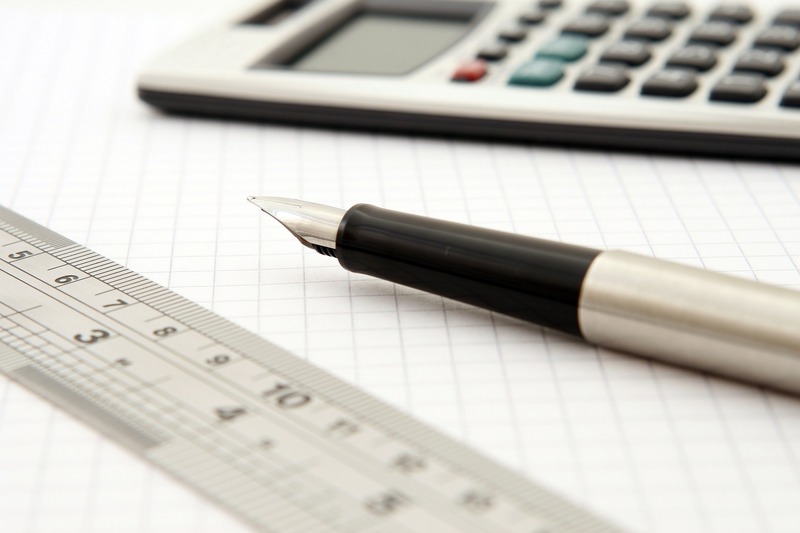 Use columns, figures and pictures to make it more readable. Use different colors and font sizes, play with layout to emphasize your main message. If there was a poster like the one below, it would have to have an extremely interesting title for me to stay and read. And even in that case, I’d prefer to have a handout and read it back home. If I have hundreds of posters to see, the time spent on one poster is something between few seconds and couple of minutes. Fonts Use large enough fonts. I would think twice before going below 30 pt (and I would use this small font only for footnotes, captions etc.). Things you want to highlight could be with a larger font, e.g. conclusions. Print a colored A4 copy of your poster and put it in front of you, arms straight. If you think your professor might have even slightest difficulties reading the text – make it larger! Another tip is to set screen to 100 % and look at your poster from 1.5-2 m away. For body text, serif fonts are easier to read. Titles are ok with sans-serifs. Figures can help you a lot. You can use them to balance your layout and to convince your audience. But be careful with the figures, they have to be self-explanatory. You are not standing next to your poster for the whole day, people need to understand it without explanations. And they need to be understood without reading the whole poster. Show a figure to a friend or a colleague that doesn’t know your work that well. If he/she understands it in no time, you are fine to go. Also, it is not the best idea to use red and green to separate “good and bad” in your results, quite many people have problem with distinguishing red from green. Colors As we noted in our earlier post (Here), it is advisable to use colors. A dull poster does not attract the attention. However, you don’t have to overdo it. I think I had a bit of that problem with my first poster shown below. Make few different color versions, ask opinions from other people. And remember that the colors in the final poster may not print exactly the same as in your printer. 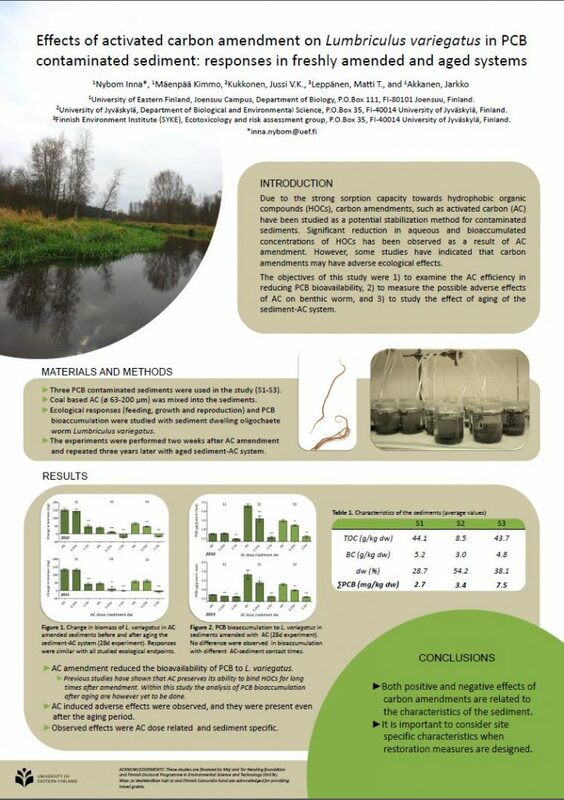 Kristiina Väänänen’s first and (over)colorful poster at SETAC Basel 2014. Software Use the software you are familiar with. If you have an opportunity to learn a new one (e.g. Adobe Illustration), go for it. But don’t do like me and waste too many hours struggling with too difficult software, finally giving up. With Power Point, you can actually go quite far. Finally, proof reading. Read your poster carefully for several times. Let other people read it as well. Print a copy and read that, sometimes you spot the mistakes better from a print. Note that in final printing, bits from the edges of your poster may be cut out (trimming edge). Therefore it’s good to have margins not to lose any of your important content. Make sure that you have your contact information on the poster (email and postal address). It is also a kind gesture to mention your sponsors somewhere on the poster. Have enough time for printing and possible errors in the process. In our group, we have sometimes needed two re-dos for a poster and that may take a lot of time. Maybe you have made too many spelling errors or something has gone wrong in the printing company. When you finally get your poster from printing, check everything one more time. Hopefully, you don’t find any mistakes at this point. Additionally, print A4-sized handouts to give out in the conference. For me, making posters is not an easy task. I don’t have a natural eye for making interesting and practical layout. My sense of color is non-existent and I get easily stuck with my initial (often bad) ideas. Time, practice and friends help though. I was actually a bit proud of my latest poster. But, a great way to get better is to follow the more talented colleagues. Our research group used to have a “Master of Great Posters” researcher Inna Nybom, who has won best poster prizes with several of her poster. I don’t know yet, how she always manages to create such delicate, beautiful and informative posters. But I continue to look her work closely, hoping to get to her level one day. Inna Nybom’s poster. Setting the bar high for the rest of us! Going to your first conference? Read these tips! Going to a scientific conference for the first time is always exciting, and it is also great opportunity to learn, network and have fun. In this blog post we have gathered some practical tips and information, which you might not even consider before going to a scientific meeting for the first time. The internet (and also your boss and co-workers) are a good source of important advice about scientific meeting etiquette, in which we will not get into details now. We shall discuss about all the little details and practicalities that no-one else tells you. It will probably be the first time that you are about to present your own work and results to a scientific public, and there are many ways that you can prepare yourself for that and make everything run smoothly in the event itself. Going to a scientific meeting also needs lots of preparation, and the more prepared you are, the easier things are likely to go. Scientific meetings may vary in size, atmosphere and procedure. In most cases you are expected to give a presentation in the conference, whether oral presentation or a poster presentation. Whether it is your financer or your boss/supervisor that requires that. They both are good ways to make your work visible to others, but there are also clear differences that you might want to consider. Technical problems are likely to happen, so have the presentation file with you in at least two different places/storages and in a format that is most likely to be accepted worldwide in different computers or desktops. Practise your presentation in advance!! Also take printed handout of your notes, if you are likely to be nervous and forget what you were about to say. Do not fill the slides with too much information, and consider placing pictures and photos to visualize your presentation and making it more interesting. 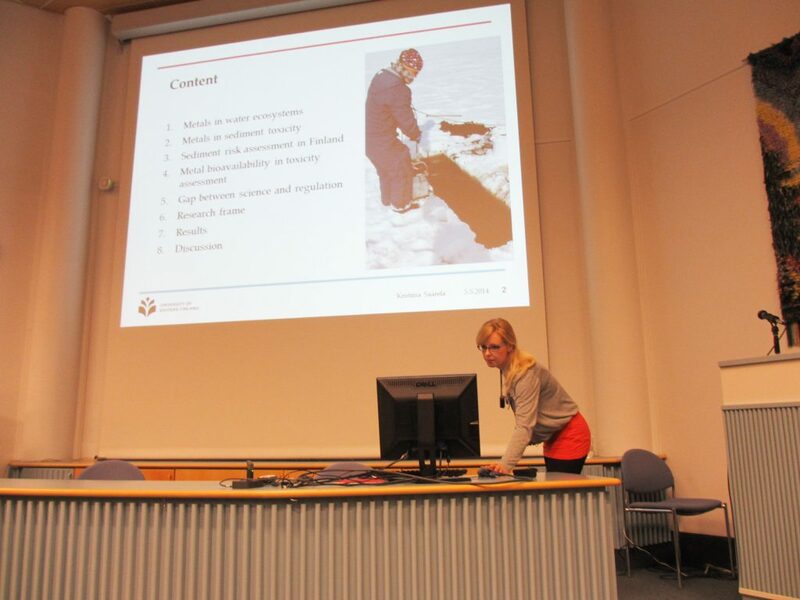 Kristiina Väänänen giving her presentation at annual meeting of Finnish Society of Toxicology. Poster sessions, instead, are nice opportunities to discuss about your work face-to-face with time with those that are interested in the topic, or have something to contribute with or share new ideas. 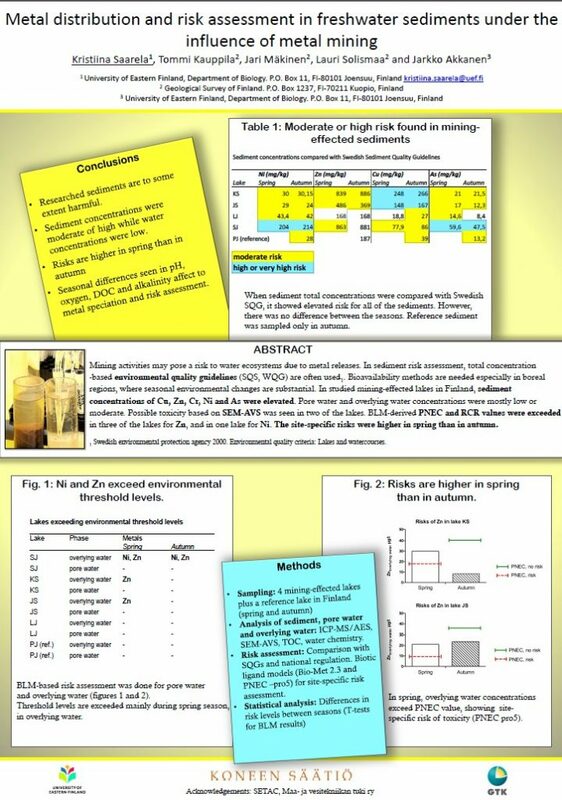 The negative thing about giving a poster presentation is that you have to make the poster, have it printed out well in advance, and carry it to the meeting and back. You might not want to have it with your hand luggage, because it is easy to forget in an airplane – or to be lost by airline, but putting your poster tube into the actual luggage might be even more risky. If you have colleagues traveling with you, consider sharing a poster tube together and carry in turns. Before leaving from office, print out A4 handouts to be given to those that are interested, and do not hesitate to hand cards with your contact details to people passing by your poster. 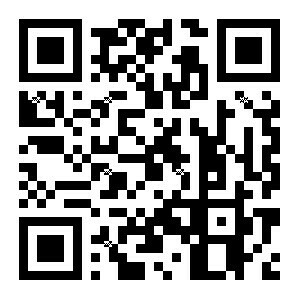 You can also print a QR code (and put it in your poster) linking to a website where your contact details or your research group can be found. In many poster sessions there are hundreds of posters and limited time to go through all of them – those that are interested and with limited time in the conference, might get back to you afterwards. Do not forget to take nails and pins for hanging your poster on the wall! Not all conferences provide those. Check the poster regulations in advance. If a European conference wants you to have a portrait poster in A0 size, it might look ridiculous in a North American meeting, there the larger is the better and poster walls are at least twice as big! Use colours in your poster and do not do what I did: grey poster on a grey poster wall was not a brilliant idea. I did not win the best poster’s prize. Remember that most people who come to see your poster, know nothing about it. Prepare a short “speech” or summary to highlight the main principles, methods and findings to be shared with the curious listeners. 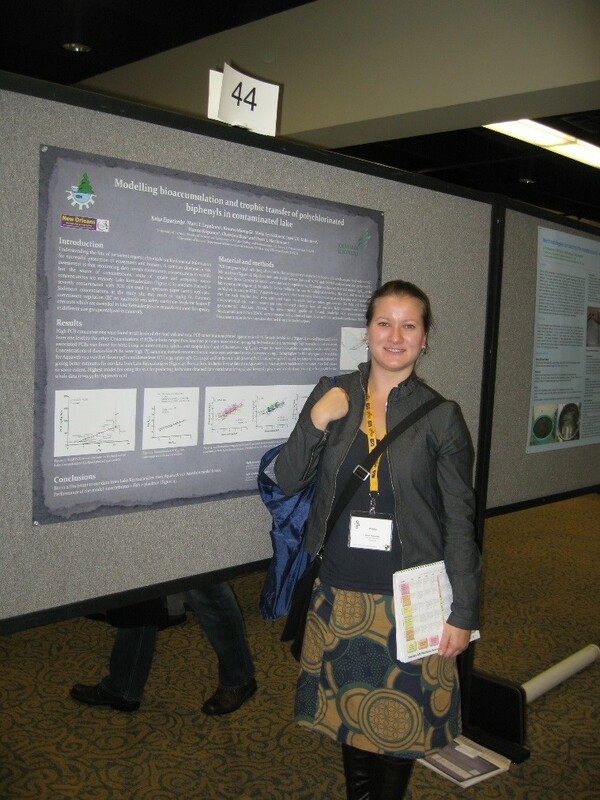 Kaisa Figueiredo with her poster at SETAC in New Orleans. Grey was the color of the day! Some conferences include coffee breaks and free lunches for the participants, while the others do not. Make sure that you are taking some snacks and a water bottle with you – otherwise you might get hungry and suffer from low blood sugar, loss of liquids and get cranky and uncomfortable. The disadvantage of carrying too much stuff with you, is that your bag might get too heavy and give you painful neck and sore shoulders. Avoid laxative food and snacks, and make sure that your snacks are not wrapped in a paper that makes noise in the lecture room. Especially if you are a woman, consider taking various pairs of good shoes with you. What is good for an evening get-together in a fancy restaurant or a cocktail party, might not be a good choice for standing by your poster for several hours, or walking long distances between the lecture halls (especially if the conference happens to be one of those with > 5000 participants and 8 sessions going on simultaneously). Some hotels have spa, poor or Jacuzzi facilities for their guests. Do not forget your bathing suit at home! This is especially important, if you are travelling to a scientific meeting in Florida in November. It would also be a good idea to pack clothes that are comfortable to wear and do not get wrinkled in your suitcase during travel. An extra pair of pantyhose might not be a bad idea, since they break easily and you might not have time or opportunity to look for new ones in the middle of a conference day. Although the social programme might be interesting and networking possibilities tempting, do not forget to have enough rest! When you have slept enough, you can handle the long days and flood of information that you are most likely to get. Especially if you have small children at home, take a scientific conference also as an opportunity to have good sleep and rest well. 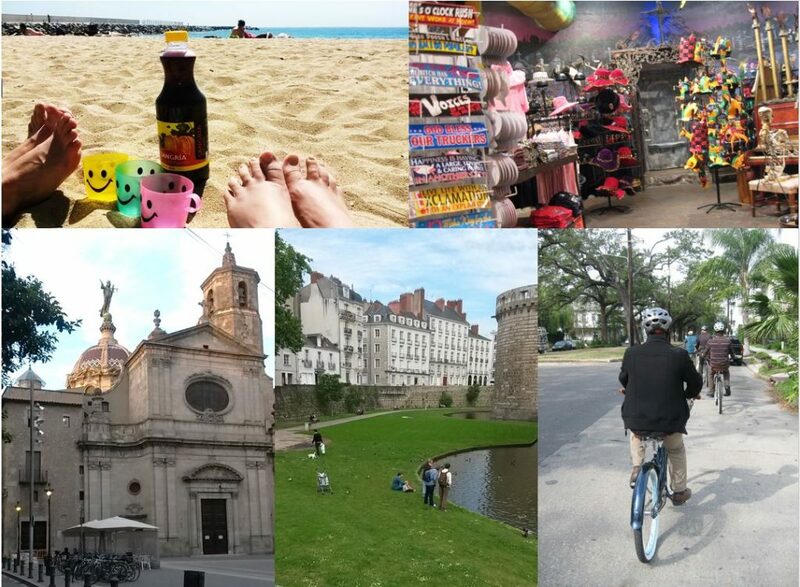 If you travel to a distant city/country where you have never been before, take advantage and travel 1 day before, or if possible, take some extra days after the conference to see around and get to know the new destination. There should always be time to relax during your conference trip! Pictures by Kaisa Figueiredo and Kristiina Väänänen. Good luck! 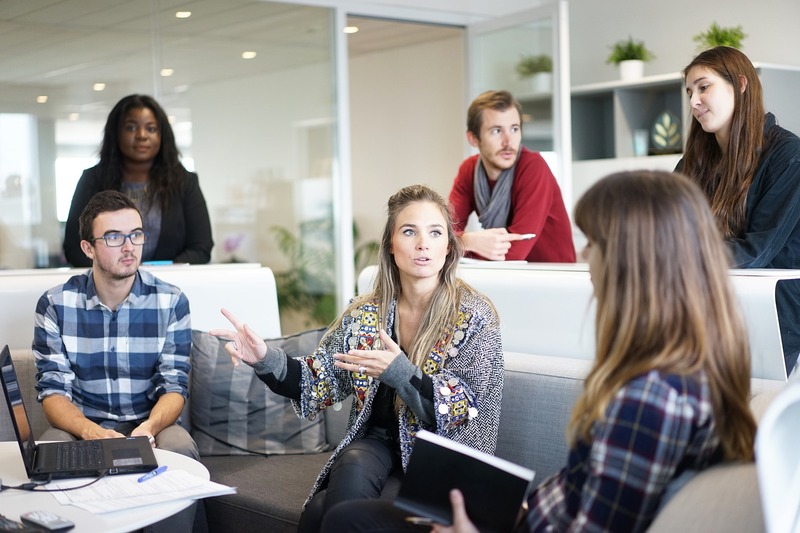 After the trip be prepared to share the experience with your co-workers, and why not, prepare a blog post about your journey, if you or your research group have an active blog. Use social media as a tool for networking and raising awareness about the event and yourself as a scientist! Twitter, Facebook and Instagram offer good opportunities for that. See and be seen! Network and share your ideas!